I know she won't read to him forever, but I love that she reads to him now. One night I heard the sound of Ella reading, and for a really long time, which piqued my curiosity. When I peeked into his bedroom I discovered that she had secured blankets all around his bunk bed and created a cozy reading nook. They read for at least an hour that night. Sure, she's racking up the minutes for her reading contest, but I know she enjoys this as much as he does. When I say my little guy has three mommies I'm not kidding. His sisters love him, play with him, discipline him (kind of an issue…) and they spoil him. Of course, they also fight and compete like typical siblings more often than I like. But when that happens I think about moments like this. It was all I could do to capture the moment and quickly exit, rather than jump in and join them. 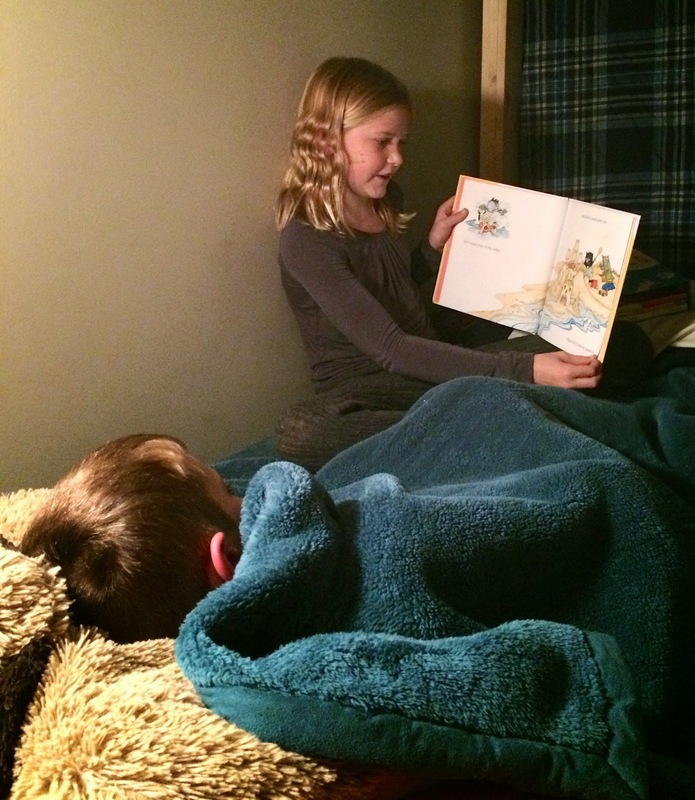 Sometimes they just need to be Ella and Owen, reading a book before bed. This is so, so sweet. It makes me remember reading to my little brother, when we were young. I hope the two of them always remember these moments. I love this too. It reminds me of time I spent reading to my little sister. We are now 47 and 45. i wish I could curl up on a bed and read to her again. I have my daughter though. She is 11 now, but still loves to read. We are reading Erin Hunter books together. Can't wait to see more of the series. Okay, just the photo made me tear up. My daughter is 28 and my son is 23 and this use to be so common. She grew up to be a teacher and loves to tell her students about her "baby" brother who is 6'3". Thanks for letting us peek in on this special moment! I'm so happy this touched you!